Priscilla Ann Wagner was born on 24 May 1945, in Brooklyn, New York City USA, and is a businesswoman, actress, television and film producer, as well as a writer in her own right, even though as Priscilla Presley she is perhaps best known as the wife of the deceased “ King of Rock ‘n’ Roll” Elvis Presley, and the mother of their daughter Lisa Marie Presley. So just how rich is Priscilla Presley, as of late 2017? According to sources, Priscilla’s net worth is estimated to be over $100 million, the majority of which came from her acting career and her business ventures, as well as inheritance from her husband. Priscilla is of part-Norwegian descent through her father, and Irish-Scots and English through her mother. As a child, she travelled a lot with her family, first with her father who was a US Navy pilot, but was killed when she was less than a year old, and then with her stepfather – Paul Beaulieu – who was a US Air Force pilot. So she lived in Connecticut, New Mexico and Texas, until her father was sent to work in Germany. Such moves were hard on Priscilla, as she had to leave schools and friends behind, and focus on meeting new people, including in Germany. It was here where she met Currie Grant, an Air Force recruit, who later introduced her to Elvis Presley, who she eventually met in Germany, and several years later in 1967, the couple married. However, the Presleys decided to go their separate ways a few years into their marriage, which ended in divorce in 1973. After that, Priscilla Presley focused on her own career, and opened several businesses of her own, including a clothing store with Olivia Bis in Los Angeles called Bis and Beau, which although relatively successful was closed in 1976. After Elvis’ death in 1977, Priscilla invested in his Graceland mansion, to open it to the public and so avoid a sale. The project worked-out well, to the extent where she recouped all her investment, and profits have hit the $100 million mark. So Priscilla became the chairwoman of Elvis Presley Enterprises, being involved in various other projects, including issuing two commemorative stamps by the US Postal Service in 1993 and 2015, and a 14-track album entitled “If I Can Dream: Elvis Presley With the Royal Philharmonic Orchestra” also in 2015. Priscilla made her television debut co-hosting “Those Amazing Animals” in 1980, then got to act the following year in a couple of episodes of “The Fall Guy”, and eventually debuted in the film industry in 1982, in Hall Bartlett’s movie “Love is Forever”, co-starring with Michael Landon and Edward Woodward. As an actress, Priscilla Presley is perhaps most notable for her appearances in “The Naked Gun” film series, with Leslie Nielsen and O. J. Simpson, between 1988 and ’94, as well as in the role of Jenna Wade in the prime time TV soap opera “Dallas”, first aired in 1978, with Presley joining in 1983, when the creators of the show decided to bring back Wade’s character. The show became one of the most popular soap operas at the time, and is still ranked the longest lasting prime time drama series, with more than 357 episodes aired during the course of fourteen seasons, and apart from Priscilla, certainly boosting the careers of Jim Davis, Larry Hagman, Linda Gray, Barbara Bel Geddes and Victoria Principal among others. “Dallas” not only won four Emmy Awards, but inspired the revival of the series in 2012, aired more than twenty years since its last season. The show also contributed to Presley’s fame and popularity in the entertainment industry. Meantime, during the ’90s and the 2000s, Priscilla guest-starred in such TV productions as “Dancing with the Stars”, “Melrose Place” and “Spin City” among several others. Additionally, in 2012 she actually appeared in pantomime, starring with Warwick Davis in the New Wimbledon Theatre, London production of “Snow White and the Seven Dwarfs”, an indication of her varied ability and popularity, and also adding to her net worth. Returning to her business activities, in the late ’80s she produced a range of perfumes, and a line in linen, both of which proved successful and contributed significantly to her net worth. Priscilla is clearly a woman who has no trouble filling-in her time productively. In her personal life, in the ’70s she had a lengthy affair with her karate instructor, Mike Stone, but of greater significance was her 22-year relationship with entrepreneur Marco Garibaldi, which ended in 2006 – they have a son born in 1987. She currently lives in Beverley Hills, California. 1 [on turning 70 years old] I don't think that a number has to stop me from doing anything I want to do, 'cause I don't feel that. I feel like I'm 40 - 45, really. I don't stop. 2 [on O.J. Simpson] To be honest...when I was around him, I thought he was a bit full of himself. 3 [on performing in pantomime] It was one of the most fulfilling experiences of my life. 4 I don't think I'll ever find anyone I'll love as much as I loved Elvis. It's pointless trying to compare him to anyone. Yes, some men I've been with have mattered to me, but Elvis was my first love, he'll be my last. 5 [on the trial of Michael Jackson] I hate to see anybody suffering and it was hard to see him suffer. I'm sure going through what he went through and sitting down, having to listen and face people who betrayed you is very, very difficult, if that's the case. 6 [on marrying Elvis Presley] I was so young and naive at the time, there was just no way I could have made a success of that marriage. I realized I couldn't give him the kind of adulation he got from his fans, and he needed that adulation desperately. Without it he was nothing. 3 Made her pantomime debut as the Wicked Queen in "Snow White and the Seven Dwarfs" at the New Wimbledon Theatre, Wimbledon in 2012 and reprised the role at the Opera House in Manchester in 2014. 4 Was a Girl Scout. 5 Considers her work with Leslie Nielsen in the Naked Gun trilogy (The Naked Gun: From the Files of Police Squad! (1988), The Naked Gun 2½: The Smell of Fear (1991) and Naked Gun 33 1/3: The Final Insult (1994)) the highlights and most enjoyable experiences of her acting career. 6 Once a self-proclaimed vegetarian, now she only avoids red meat. 7 The song "Personal Jesus" by Depeche Mode was inspired by Presley's 1985 autobiography. 8 Channeled by singer Lana Del Rey. 9 Studied karate with Chuck Norris in L.A. and Kang Rhee in Memphis. 10 Designs luxury linens in collaboration with Australian fashion designer Bruno Schiavi. Also has a furniture line, the Priscilla Presley Home Collection. 11 Succeeded Jaclyn Smith as spokesmodel for Wella Balsam shampoo (1979/80). 12 Is a celebrity advocate for the Humane Society of the United States' Animal Rescue Team. 13 Owns two Tennessee Walking Horses, which she stables at Graceland. 14 Older half-sister of Michelle Beaulieu Hovey. 15 Pursued the role of Susan Atwell in No Way Out (1987) which eventually went to Sean Young. 16 Had long-term relationships with karate champion Mike Stone and male model Michael Edwards. Other prominent men linked to Presley include Julio Iglesias, Richard Gere, Kirk Kerkorian, Robert Kardashian and Nigel Lythgoe. 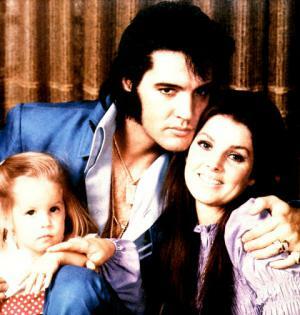 17 Former father-in-law Vernon Presley appointed her as executor of Elvis' estate upon his death in 1979. Priscilla founded Elvis Presley Enterprises Inc. the same year and remained the corporation's president until daughter Lisa Marie took full control of her inheritance at thirty years of age. 18 Was crowned Queen of Del Valley Junior High by classmates in Austin, Tx. In high school, she was voted Best-Looking. 19 Friends with Kris Jenner. 20 Her favorite movies are Doctor Zhivago (1965) and Gone with the Wind (1939). 22 Won $75,000 in a 1998 defamation lawsuit against U.S. airman Currie Grant for claiming they had an affair before he introduced her to Elvis Presley. In 2005, she considered suing photographer Terry O'Neill for his claim that he had an affair with her in the mid-1970s. 23 Though originally from the East coast, she grew up mostly in Austin, Texas. Her family moved there from Maine when she was in second grade and left the summer before she started high school. 26 Hal B. Wallis, a Hollywood producer who had financed several of Elvis' earlier films, was interested in signing Priscilla to a contract in the '60s. Elvis, however, had no intentions of allowing his wife to have a career of any kind; in his opinion, albeit a very common one at the time, "a woman's place is in the home looking after her man". 27 Mother-in-law of Michael Lockwood. Ex-mother-in-law of Nicolas Cage and Danny Keough. 28 Met future husband Elvis Presley in Wiesbaden, Germany in 1959 when she was fourteen years old. 29 In 1983, she became the third actress to play Jenna Wade on Dallas (1978), after Morgan Fairchild in 1978 and Francine Tacker in 1980. 30 Grandmother of Riley Keough and Benjamin Keough. 31 Split with boyfriend of 22 years, Marco Garibaldi, in early March 2006. Presley reportedly confronted Garibaldi over his commitment to their romance and the argument resulted in him being asked to move out of her Beverly Hills home. The pair has a 19-year-old son Navarone. 33 Ambassador of the Dream Foundation, a Santa Barbara-based wish-granting organization for terminally ill adults. 34 Is portrayed by Antonia Bernath in Elvis (2005) and by Season Hubley in Elvis (1979). 35 In 1988, she left Dallas (1978) after five seasons because she became unhappy with the direction of the series and her character. 36 Was, very briefly, the mother-in-law of singer Michael Jackson. 37 Her father had German ancestry. Her maternal grandfather was the son of immigrants from Egersund in Norway, and her maternal grandmother had English and Scotch-Irish ancestry. 39 Turned down a main role on the television series Charlie's Angels (1976). 40 Her real father, James Wagner, was killed in a plane crash when she was six months old. She was adopted by her mother's second husband, Paul Beaulieu. 41 A successful boutique owner in 1973-76, clients included Natalie Wood, Barbra Streisand and Cher. 42 The developer of an international fragrance line since 1988. Her fragrance line including Moments, Experiences, Indian Summer, and Roses and More. Moments was worth $90 million a year in 1996. 43 Has regular chemical peels to get rid of wrinkles and brown spots. 46 Lived with Marco Garibaldi from 1984 to 2006. 47 Mother of Lisa Marie Presley (b. 1968) and Navarone Garibaldi (b. 1987). The Naked Gun 2½: The Smell of Fear 1991 performer: "THE WAY WE WERE"
How old is Priscilla Presley, how many children did she have with Elvis and when did they get married?